When the opportunity to purchase a power tool arises, you can often be flooded with a clash of feelings, such as excitement and confusion. Even for a straightforward device such as the chainsaw, a simple online query can turn up thousands upon thousands of products, many of which yield lengthy descriptions and complex terminology that may not appeal to someone who is just looking for a decent hedge trimmer or economical way to harvest some firewood. In order to take the guesswork and reduce the need for a lap side Merriam-Webster, we've created an all encompassing guide and top product reviews for the best battery-powered chainsaw. Of course, just as no two chainsaws are alike, we've done our best to recognize the full spectrum of benefits that each chainsaw has to offer. Before settling on a battery-powered chainsaw, it is a good idea to learn a bit about the basic anatomy of the tool. Major parts, such as the motor, chain, and battery, vary between brands. Moreover, optional variations, such as cords, size and the shape of the saw, automatic oil, and chain breaks, promote varying levels of power, safety, and durability. Prior to deciding upon a product, compare the bundle of features with its intended use. Owning a chainsaw is essential to most home owners. Whether the bushes need trimming or you need to clear a felled tree after a storm, it is one of those items you'll appreciate having on hand. 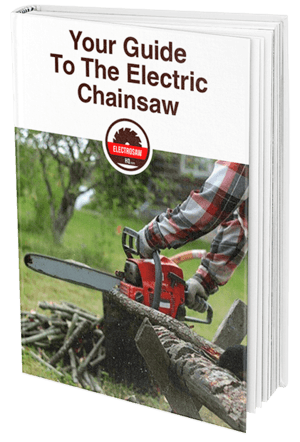 While battery operated chainsaws harbor more limitations than their gas counterparts, they are an economical, easy to use, and provide the necessary power to finish household chores. The number one advantage to using a battery operated chainsaw is mobility. While you lack time constraints when operating a corded saw, batteries eliminate the serious safety hazard of a tethered cord. With a battery-powered saw, you've got the ultimate freedom of mobility. This can help you to finish a job quicker and more efficiently. Another great advantage is increased dexterity. Many battery-operated models are lightweight and ergonomically designed. This eliminates the potential learning curve that comes with handling large power tools. Instead, you can focus on getting the job done quickly and efficiently. Look for padded front and rear handles and machines that are comfortable to lift.Modern chainsaws also include premium safety features, such one touch triggers, automatic kick backs, and chain locks. Moreover, they are inexpensive and don't require the usual upkeep, such as chain oiling. They are also a superior option for people who are just learning or getting used to medium sized power tools. We measure power in terms of size, length, and duration. In other words, the more powerful chainsaw can cut through bigger objects, at a faster speed, for a longer duration of time. In order to gauge a machine's strength, we need to identify the properties of various parts.For starters, the chainsaw blade size helps us identify the size of the cut. Chains range in size from 6" to 20", although average saws are between 14" and 16" inches. For standard backyard jobs, 14" will give you plenty of coverage.Duration is a bit more complicated to measure as it is correlated with battery life. It helps that most chainsaws are readily identified by their battery type and size. For example, the 40V Lithium-Ion Black and Decker or Makita XCU02Z 18V X2 LXT. We'll talk more about battery power later. Gas powered chainsaws require ongoing, messy maintenance, but some people are willing to put up with this over constantly recharging and replacing batteries. Not everyone adapts to frequent breaks in work. However, this issue can easily be tackled by purchasing an additional, backup batteries. Many batteries are compatible with various power tools and can be a valuable asset to your tool shed, even if the overhead cost doesn't appeal to you. Don't forget that there is more to these chainsaws than their power sources. Bars, chains, handles, oil tanks, and engines can help determine the value of a chainsaw. Meanwhile, a well-rounded chainsaw includes a combination of valuable features. Some products are known for brand specific perks. For example, a Stihl battery chainsaw review may focus on self-manufactured chains, while a Black and Decker review may pinpoint their self-adjusting tension rods. We've done our best to steer clear of company bragging rights and review these products on their overall performance and power. BLACK+DECKER LCS1240 40V MAX Lithium-Ion Chainsaw, 12"
The Black and Decker LCS1240 Max Lithium-Ion, 12" Chainsaw features a powerful 40V Lithium battery. Lithium batteries are known for being lightweight, having a long life, and for not having a memory effect, meaning they won't start prematurely dying on you. Weighing just over seven pounds can produce clean rapid cuts with minimal kickback and prolonged life. The automatic oiler and tool-free tension make gas powered chainsaws seem prehistoric in terms of convenience and usability. Never again will you need to mess around with a blend of messy industrial liquids. An extra battery will keep you going through full jobs. However, once charged it can hold its power for over 18 months. The GreenWorks Pro GCS80420 features a big daddy 18" chain. While you may be wondering if a battery can power something of this size, we're happy to note that the 80V 2ah battery not only holds to the test, but it can be fully charged in nearly 30 minutes and is capable of doing nearly 150 cuts in one charge. Still, investing in a secondary battery is never a bad idea. Considering all its power, the GCS80420 only weighs around 11 pounds and features padded front and back handles. Steel bucking spikes, a metal wrap around handle, and electronic chain break make this a preferred choice when it comes to user safety. While the GreenWorks 20362 24V 10-Inch Cordless Chainsaw is a comparable smaller model, the Pro GCS80420 is going to allow you more power, dexterity, and life for a slightly higher price tag. This is by far the best battery chainsaw in the Greenworks line. DeWALT DCCS690M1 40V 4AH Lithium-Ion XR Brushless Chainsaw, 16"
The DEWALT DCCS690M1 40V 4AH Lithium-Ion XR Brushless Chainsaw is the best rechargeable chainsaw. The 40V Lithium, 4AH battery and brushless motor put you in good hands. Meanwhile, the 16" Oregon bar and chain features a reliable chain brake to avoid any kick back mishaps. This means you are able to confidently trudge through projects small and large without having to worry. You also won't have to worry about the mess of oil and gas. Simply charge the lithium battery and the automatic oiler will do the rest. All that is left to do is hit the trigger and you're in for a few solid hours of cutting down trees. Dewalt is an excellent power tool company and this machine is no exception; however, it's worth noting that there seem to be minor manufacturing issues with the LubriLink automatic oiling system. Nevertheless, that would not stop it from making it into the best battery operated chainsaw review. With a variable speed trigger, low kickback, chain brake, and tool free tensioning, Dewalt sought to build something that is strong and safe. The Poulan Pro 967044101 40V Chainsaw, 14" is a compact and low key chainsaw option. The 40V lithium-ion battery isn't huge, but you get a far greater charge than you would expect. Overall, the 14" inch bar and chain are capable of felling trees with up to 6" diameter, trimming hedges, and accomplishing medium-large around-the-house tasks. While we aren't quick to call any tool "maintenance free," the Poulan Pro saw comes pretty close. With an automatic oiler, tool free tension adjustment, and easy starter, there is virtually no learning curve when it comes to this device. Moreover, at just over nine pounds and with ergonomically designed, padded grips, you won't feel weighed down and exhausted after a session. The Zombi ZCS5817 is bound to be your new favorite tool considering its powerful 58-volt lithium 4Ah battery and brushless motor. A full charge gives you enough time to complete a small job, and a life indicator helps you track your available power as you work. 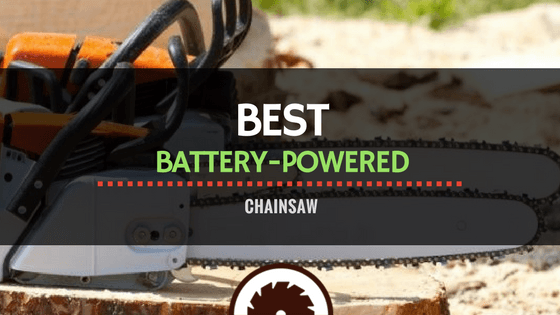 Using a battery to power your chainsaw should be easier and less maintenance than gas, but it is important to understand the technicalities before making your purchase. You'll find that most battery operated chainsaws are named for their voltage and amp hours, but how does that translate into power and capacity? We can use voltage and amp hours to determine watt hours. In lithium-ion batteries, watt hours tell us how much power the machine will consume per hour. Therefore, the greater Watt hours the greater run time in the chainsaw. This can also determine the number of cuts you get in per charge. While many chainsaws come with standard batteries and chargers, you can often buy replacements with higher capacities. Of the chainsaws that we've reviewed, four have 40-volt batteries, but only one has an 80-volt battery. Since voltage determines the amount of power you get, it's no wonder that the 80v battery possesses the larger chain and bar. These five chainsaws also vary in amp hours, which roughly translate to runtime. The Black and Decker LCS1240 40V MAX Lithium-Ion Chainsaw is powerful enough to cut a cord of wood on a single charge. Moreover, it is lightweight and has zero battery memory. This is interchangeable with other Black and Decker kit 40v batteries, such as the Black and Decker 40v trimmer. The BLACK+DECKER LCS40 40V MAX Fast Charger is greater for speeding up the charge. Backup or replacement batteries are readily available, such as this Black & Decker LBXR36 40-Volt Lithium-Ion Battery. The GreenWorks Pro GCS80420 80V 18-Inch Cordless Chainsaw comes with a solid kit battery. However, this can be interchanged with GBA80200, GBA80400 and GCH8040 models of batteries. The GreenWorks GBA80200 80V 2.0AH Lithium-Ion Battery is the most affordable. These batteries charge rapidly, indicate ongoing usage, and barely fade. The DEWALT DCCS690M1 40V 4AH Lithium-Ion XR Brushless Chainsaw can be purchased with a 4ah or 6ah battery. Comparable charges will also need to be purchased. A separate, superior battery pack can be purchased. For example, the DEWALT DCB406 40V 6AH Battery Pack offers a 4-LED fuel gauge, no memory, and no self-discharge. For the Poulan, the Poulan Pro 501099501 4Ah 146 Wh 40V Replacement Battery provides 40v of power. It is interchangeable with any other Poulan products and therefore promotes a sense of brand loyalty. On the downside, it requires a two hour charge time. Last but not least, the Zombi ZCS5817 16-Inch 58-Volt 4Ah Lithium Cordless Electric Chainsaw features a 58 volt 4Ah kit battery. This works well, but there are no known compatible batteries from other manufacturers. Lithium-ion batteries are lightweight and easy to use. They typically clip in and out of the chargers and into the saws with no hassle. Some require a brief cool down. While this may not seem like a necessary step, it can prolong the life of the battery and improve the performance of the machine. The charge time for like-sized batteries does vary, but there are a variety of interchangeable batteries and chargers on the market to help you optimize the power and duration of your product usage. After trudging through a slew of online products, we've come to the conclusion that the 12" Black and Decker LCS1240 40V MAX Lithium-Ion Chainsaw is the best battery-powered chainsaw of 2018 on the market today. Lightweight, fully equipt, with a superior battery, this chainsaw offers the best value for your money.